The Gumby Central Gang was thrilled to be part of the special exhibition: Between Frames: The Magic Behind Stop Motion Animation—which was on view at the Disney Family Museum in San Francisco, California, from September 2012 through April 2013. The exhibition explores the evolution of stop motion animation in the United States—especially in special effects, television, and film—while examining some of the key milestones in the field. Innovators include Willis O’ Brien (King Kong), Tim Burton (Tim Burton’s The Nightmare Before Christmas), Art Clokey (Gumby), Ray Harryhausen (It Came From Beneath the Sea), Henry Selick (Coraline and James and the Giant Peach), Phil Tippett (Star Wars and Jurassic Park), and more. This 100-year-old art form launched Walt Disney’s career in animation. The exhibition includes behind-the-scenes photographs, replicas of the original armatures, a Digital Input Device (DID), puppets and other interesting tools of the trade. Gumby is represented with storyboards, an original Gumby puppet mold, a description of how a clay character is made, a morphing Gumby, and photos of Art Clokey at work. 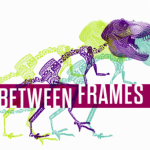 Visitors are invited to manipulate and touch armatures at a special interactive station. A video spotlights great moments in stop motion animation, and episodes and clips from various stop motion masterpieces are shown. 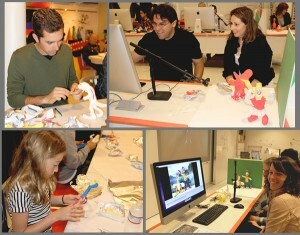 We especially enjoyed the kick-off party, “Animate Your Night,” in September, during which visitors made clay puppets with wire and foil armatures and created their own digital stop motion animation. There was so much wonder and creativity in the air! 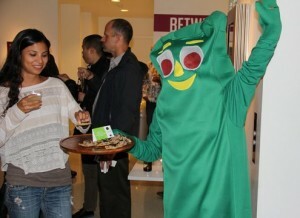 The entry hall featured a sculpted cake adorned with sweet likenesses of the characters in the exhibit, and the caterer even got into the spirit by dressing in a Gumby costume to deliver tasty treats. Too much fun! 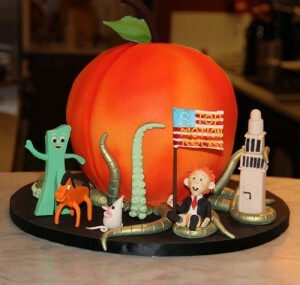 Can you believe that this is a cake? The next time you are in San Francisco, stop by the Walt Disney Family Museum for an introduction into the world of animation and Walt Disney’s life. The well-designed museum will surely delight animation fans of any age. Check out their calendar of events for their list of fascinating talks and activities.